Sunday, April 28, 2019, following worship with regard to Shared Ministry. Please click on each link to view the document. or where you are on life's journey, you are welcome here! If you are searching for a church home, we invite you to consider St. John's! 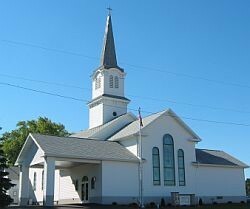 St. John's is located at W3401 Orchard Road, northwest of Howards Grove. Highland Road. Turn right on Highland Road to Orchard Road, then turn left. St. John's is 1/4 mile on the left. From Kiel, take State Highway 32-57 south. Stay on Highway 32 when Highway 57 splits off to the right. In Ada turn left onto Orchard Road. St. John's is 1 1/2 miles on the right. Look for the royal blue UCC signs on the Highway 32 and on Orchard Road.